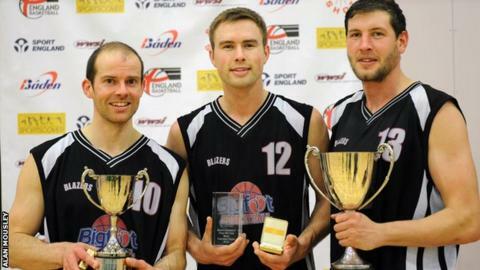 Forward Alex Dorr says captain Sam O'Shea's pre-match speech provided the inspiration for Derby Trailblazers to win the England Basketball League Division Two play-off final. Dorr was named most valuable player, with 19 points, 20 rebounds and three assists in Derby's 73-57 win against Ipswich in Manchester. "Sam gave a great motivational talk before the game," said Dorr. "It was crazy how much energy we had going into the game - it was perfect." O'Shea also imposed himself on court with a 17 point, 10 rebound double-double, while Dan Watts contributed 10 points, six rebounds, while JoJo Owusu-Ansah finished with 12 points and two steals. Leigh Greenan led the way for Ipswich with 12 points and 17 rebounds against the league-winning Trailblazers.